Opening Hours: Monday to Wednesday 10am – 8pm, Thursday to Saturday 10am - 10pm, Sunday 1pm – 6pm. Please note, the market will close at 6pm on Thursday 22 December 2016. 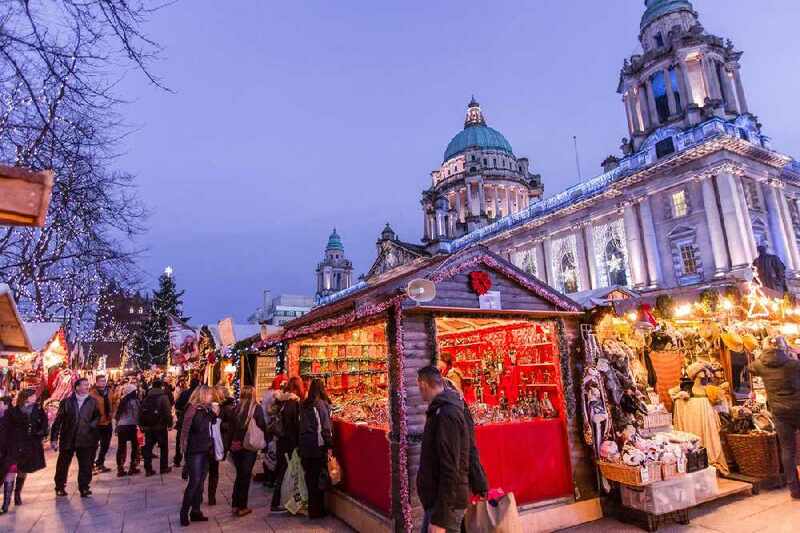 The Belfast Christmas Market returns to City Hall on Saturday 19 November from 12 noon. Once again visitors will be spoilt for choice with a huge variety of authentic continental goodies including: crepes from France, Dutch pancakes, Belgian chocolates, an exotic selection of ostrich, wild boar and crocodile burgers, giant bratwurst from the iconic Schwenkgrille, Spanish paella and nougat from Italy. Visitors can take a culinary trip around the world before relaxing in one of the bars, serving drinks from around the world until late into the evening. Enjoy a walk around, warm up with some mulled wine, eat delicious continental food and take a browse in the wide range of stalls showcasing festive arts and crafts from across Europe and beyond. For those Christmas market lovers, make sure to take a visit to Belfast this Christmas and get into the festive spirit!